The robust energy industry in North Dakota offers many opportunities to pursue high-paying careers in a variety of energy sectors. Bismarck State College’s National Energy Center of Excellence (NECE) offers education and training for energy jobs in power plant, petroleum and oil, renewables and nuclear energy, and everything in between. Much of this training is offered in two years or less, getting you into an exciting and fast-paced energy workforce in short order. Job Service North Dakota data shows that in June 2015, an estimated 31,228 workers were in direct or support positions for the industries of oil and gas extraction, coal mining, utilities and pipeline transportation, with an estimated annual wage of $103,000. These statistics don’t reflect employment or wages in ancillary businesses or industries working in the energy field, such as trucking, construction, engineering, manufacturing and repair services. Bismarck State College’s NECE bachelor’s degree of Applied Science in Energy Management was ranked the 13th most affordable online management degree in the nation by GetEducated.com, a consumer group that publishes online college rankings and online university ratings. In 2016, 753 students earned a degree or certificate in one of the BSC NECE training programs. Of those graduates that responded to the Bismarck State College Career Services survey, 99 percent of the graduates were continuing their education or employed. Recent graduates who were employed reported salaries ranging from $20-40 or more per hour. Welcome to the National Energy Center of Excellence (NECE) located at Bismarck State College in Bismarck North Dakota! The NECE is home to many nationally-recognized energy industry degree education and training programs for energy-related jobs throughout North Dakota and beyond. Enrollments in the NECE program make up one-fourth of the Bismarck State College campus student body. Students have the opportunity to complete programs on-campus or online. On-campus degree students use our world-class, one-of-a-kind lab equipment designed to prepare the next generation of energy industry employees. Online degree students enjoy the flexibility of completing courses or a degree program built for those who cannot attend on-campus courses. The online courses offer simulations, animations, discussions and real-time lab sessions operating real equipment to offer the participant the same hands-on experience as the on-campus students. Advisory Boards consisting of local and national industry experts review the NECE’s curriculum, lab equipment, online tools and specific program structures. The Advisory Boards provide the NECE faculty and staff with the most up-to-date information to ensure the programs are preparing the students with current technology and standards for a smooth transition from college to the workplace. The NECE also offers a wide range of industry education and training options to assist in maintaining certification/training requirements, educating new hires or as a supplement to existing training programs. 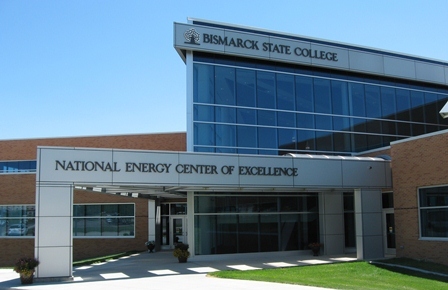 Visit the Bismarck State College National Energy Center of Excellence page, or see additional information under the “Energy Programs” tab for industry-specific certification.